Welcome to the Major Tom’s War website, a growing collection of online archive resources which Vee Walker used in the creation of her novel Major Tom’s War. 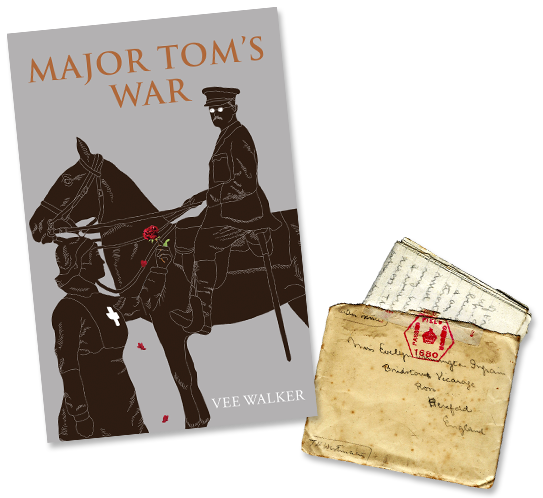 Within the site you will find free complementary resources you can use to get deeper into the experiences of the characters of Major Tom’s War during 1914 – 1918 - and beyond. The collection within the site is still being added to and will grow considerably during 2018/19. Feedback and comments welcome. If you have not already read the novel, order your copy here. Vee Walker is an experienced museums and heritage consultant working in the UK and Europe. The discovery of a long-forgotten family tragedy led her to spend almost a decade researching and writing Major Tom's War, her debut novel. It is rooted in her grandfather Tom Westmacott's account of the 1914-1918 conflict as contained within his war diary scrapbook, lovingly assembled by her grandmother, Evie Winnington-Ingram. This website is a companion to the novel, and provides access to much of the source material from Tom's war diary.